Arden Bement ’54 stepped down as director of the National Science Foundation at the end of May 2010. Appointed by President George W. Bush in 2004, he was the 12th director of the 60-year-old agency and only the second engineer to fill the post. Shortly before his NSF departure, Bement welcomed me into his spacious office atop the agency’s Arlington, Virginia, headquarters, where our conversation covered both the personal and the professional: he spoke on topics of national concern that he’s addressed during his term at the NSF; he spoke about his own career and identified some of the strategies that have contributed to his success; and he described some of the global changes he sees on the horizon for us all. Prior to joining the NSF, Bement served as director of the National Institute of Standards and Technology for three years. During his career, he led research and engineering organizations for the Department of Defense; held distinguished academic and administrative appointments at Massachusetts Institute for Technology and Purdue University; administered and spearheaded research for TRW; and served as a senior scientist for General Electric. From 1954 until 1992, he served as a commissioned officer in the U.S. Army Reserves. And for many of these years, he was also busy on the home front, helping his first wife raise their eight children. While every one of these jobs clearly came with great demands and responsibilities, Bement, 78, says that administering the NSF’s multibillion-dollar budget ($7.3 billion in 2010) was one of the most challenging. One would think that leading the world’s largest sponsor of fundamental science and engineering research for six years would provide a fitting capstone to his distinguished career, and make retirement an appealing prospect. But Bement had no such plans. Rather, he was eagerly looking forward to returning to Purdue University, where he’s been on a leave of absence since becoming director of NIST in 2001. He spoke about the Global Policy Research Institute that he’s helping to establish on campus, and the institute’s mission to elevate the role of science in policymaking. The conversation lasted almost two hours; what follows are edited highlights of the exchange. The pace of scientific and engineering research is faster today than ever. What do you see as some key implications of this for society? It’s not only that the rate of change has increased, but the time from concept to application has compressed. We used to think in terms of two or three decades to take a new idea and reduce it to practice. Now it can sometimes occur within a handful of years, or even a few months. This is partly because there are so many more people thinking along the same lines and pursuing the same research, they beat their ideas against each other so somehow one has a faster convergence model than just one person thinking off on their own. Some problems are at the level of complexity that one person can’t have the breadth of insight necessary to see all the nuances and all the variables, so they are dealt with at the systems level, requiring teamwork and the sharing of insights among scientists in an interdisciplinary and a free-inquiry way. There are no set formulas for this. It’s free-flow. Ideas are exchanged until suddenly something clicks, and then you can converge on a solution very quickly. That’s going on around the world. You might come up with a new idea, but that doesn’t necessarily mean you are going to be the one who is going to capitalize on it. Someone else is probably thinking about it and maybe has a better approach for reducing it to a practice of earning wealth out of it. What accomplishment are you most proud of from your time at the NSF? Establishment of the Office of Cyberinfrastructure is probably one of the greatest achievements and one of the most important. It clearly puts the U.S. in an undisputed leadership position when it comes to computation. Cyberinfrastructure is an integrating force that can take research and education to an entirely new plane of discovery, and OCI has enhanced the capability of building networking and high-end computational capacity at U.S. universities, including a network that spans the country and is connected with the world. It has already altered our familiar research, education and innovation landscapes; we have one petaflop-scale computer at the University of Illinois coming online in the next year or two. We have a Kraken computer at Oakridge National Laboratory that is right at a petaflop. So that’s at least two that are ranked among the fastest computers in the world. And they are all interconnected on a network with a capacity of about five and a half petaflops. So that gives the U.S. more computing power for universities than any other nation in the world, and we can expect much more to come. NSF’s many international collaborations involve sharing valuable information with international competitors. How does this improve the United States’ ability to compete with these same countries? At the frontiers of science and engineering, competition is more blurred. It’s important to know how to collaborate in order to know how to compete. A case in point is our aerospace industry. For every major award for which they compete, they have to cooperate. They know more about each other than most industries know about their competitors. It’s through that collaboration that they are able to compete at such a high level. I see it the same way in world markets. Scientists have always been fairly open in sharing their ideas and data. I think that openness is something we can continue to capitalize on. What will be the determining factors for U.S. prosperity in the future? You’ve made STEM education a priority during your time at the NSF. What should be our top priorities in this area? To instill an understanding of science and technology, it’s important to start teaching basic principles at a fairly early age, rather than wait until secondary education to take an inquiry-based approach to teaching how the world works. I think schools often underestimate what young people are capable of understanding and what will fascinate them. It’s the difference between treating children like you can somehow cut their heads open and pour in knowledge, versus learning through their own inquiry, through projects, through self-based learning, through peer-learning. Many young people today are experts at social networking using PDAs, cell phones and electronics of various forms, but we have not yet learned how to turn that into an advantage when it comes to peer education and peer learning. We need to somehow develop learning networks where education becomes a 24/7 activity: continuous education giving continuous satisfaction to students through exploring the unknown and finding their own solutions. Are there other ways you feel U.S. K-12 education can be strengthened? We have ceased in some respects to honor the teachers and recognize the importance of their role in our society. I think education is daunting enough and challenging enough that it deserves much more attention as far as quality, as far as recruitment of top talent, and as far as freedom of inquiry and practice. So much is talked about in terms of teachers’ salaries as a key determinant for attracting and retaining good teachers, and it is an important factor, especially for those who want to get married and raise a family. On the other hand, a lot of it has to do with respect, professional treatment, and again, the freedom to develop their own approach to education and try new things. Mines celebrated its 136th Commencement last week. What advice would you give to this year’s graduates as they launch their careers? will challenge you to continually learn. Be a work in progress. Don’t paint yourself into a corner. Recognize when you get to the flat end of a learning curve, and when you do, go look for another learning curve, continually challenge yourself. Build a network. Recognize that often success comes from those whom you learn from and impress in terms of your industry, your integrity, your openness and your adaptability. Most leaders are looking for adaptive people because change occurs so rapidly. Be willing to go to new parts of the world, adapt to new learning styles, to new organizational structures, to new ways of teaching, new modalities. If you start turning people down on the basis that it’s outside your comfort zone, you get labeled in the network as unmovable. On the other hand, if you are excited about new possibilities and new opportunities and new challenges, then when opportunities arise, they will seek you out. If you try to climb a ladder, you’ve got only one direction to go, so I encourage people to consider a spiral rather than a ladder. Move from one situation to another. You can be in the same universe, the same company, but seek out different challenges, different assignments. Maintain your flexibility. There are a variety of ways of seeing and defining a problem. Broaden your outlook through new knowledge. Explore new subjects: music, great books, political science, history. Seek out managers who challenge you. The key to my satisfaction has been to always pick a person I could learn from and admire and feel good about working with; someone who can be a mentor, and who has an interest in my future. I can go through my entire career and look at how each step along the way was influenced by someone who was part of my network, someone I had worked with or worked for over time. I was very fortunate. I had a wife and family who were willing to support me. But that was in the days when you didn’t have more than one wage earner in the family. Now it’s a many-bodied problem. We think we live in an age of mobility, but it’s really almost an age of immobility, because often it’s hard to displace two people at one time. And it may not be possible for everyone. In my case I’m beyond raising my own family. I’m raising the third generation, great-grandchildren, so I have some flexibility. Are you optimistic about the future and the world your great-grandchildren’s generation will inherit? Obviously there are going to be major challenges. The future will be different. There will be fewer resources, which means that we will have to be very innovative in how we use them. I think that energy sustainability will change, and how we justify investments will change. It’s really a question of how quickly our society will adapt to making investments now for returns in the future, rather than for immediate returns. That’s a social conditioning, a behavior, which is still in an emergent state. And it’s still not clear whether our society is willing to adapt to take a longer view, but I think we can be happy with a lot less; I could be happy with a lot less. We are educating people better, which means that young people have more opportunity, more choice. There’s less hunger in the world today. There are more opportunities for women in the world, even though there are still areas where they are highly oppressed. Many argue that if you educate women and give them opportunities, it adds more to the stability of the world than anything else because of their social outlook. But I’m optimistic about the younger generation. Children now are more excited about the future. They are less risk-averse. They are more willing to accept the future on its own terms. I think they take less for granted. Why did you decide to come to Mines? During my senior year in high school in Pennsylvania, my father was recruited to be the chief electrical/mechanical engineer at Climax Molybdenum Mine. After I graduated, I went to work at the mine as well. My supervisor, Prentice Gain, was a  graduate of Mines, and we got to know each other because we were both reading Nietzsche. Someone had donated a set of German philosophy books to the reading room: As you can imagine, this was an unusual addition compared with the other books. So I’d be reading Nietzsche during the break in the midnight shift, and he was reading another of Nietzsche’s books, and we started talking. It was he who encouraged me to go to Mines. In fact, he helped me fill out the admission form, and then made a life-changing covenant with me. He agreed to put up the first semester’s tuition. If I made it beyond the first semester, I wouldn’t owe him a dime. If I didn’t make it, I could pay him back out of my wages. As an in-state student, I didn’t have to pass the entrance exam. They allowed me to attend for one semester to see if I could make it. If I didn’t, I was out. So I had those two challenges in front of me. That first semester was a killer. 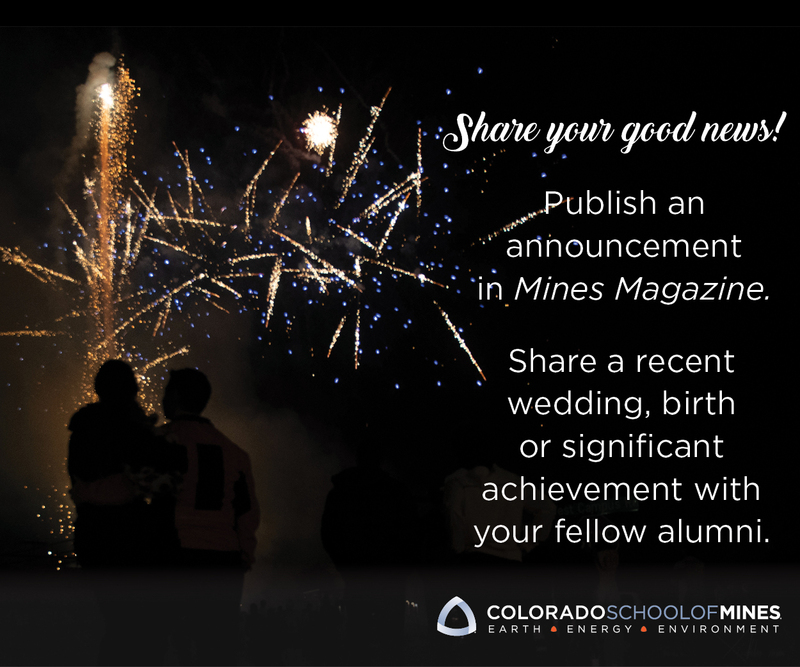 If Colorado School of Mines taught me anything, it was how to succeed in spite of indomitable challenge. Once I got through the first semester, I wasn’t going to leave. The school has changed a great deal since then. How do you feel about the Mines of today, versus the institution you knew in the early fifties? The school has done remarkably well. 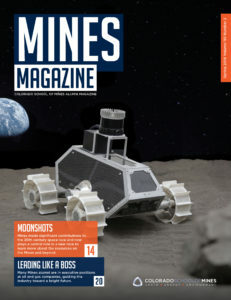 Mines has kept faithful to its niche, in terms of the natural sciences, mineral science and earth science, while other schools were moving away from these fields. Right now, we’ve gained perhaps the highest level of recognition for excellence among top-tier universities that wouldn’t have accepted the school as a peer a few years ago. As an undergraduate university, it stands alone, and the graduate research program is very much stronger than it was in the past. Mines turns out a very special product. When the interview ended, much too soon for me, I shook Bement’s hand and took a last look around. A recently completed portrait sat on an easel in the corner, a stately full-body rendering of the director standing in his office. It was skillfully painted and likely composed to complement other portraits of his predecessors, but something didn’t fit. It wasn’t until later that I put my finger on it, he was standing still. Based on all that I had learned about the man, his life has been spent in motion. You can’t achieve all that he’s achieved standing still. And he still isn’t.